"This quick recipe is a great way to use up old bread. Serve with wine and a nice side salad for a bistro-style meal." Whisk eggs, milk, and herbes de Provence together in a bowl until smooth. Dip 1 slice bread in the egg mixture until evenly soaked. Melt butter in a skillet over medium heat; cook the dipped bread until slightly browned, 1 to 2 minutes per side. Transfer bread to a paper towel-lined plate. Repeat dipping bread in egg mixture and cooking in the skillet with remaining slices. Cook and stir spinach in the same skillet over medium heat until wilted, 2 to 3 minutes. 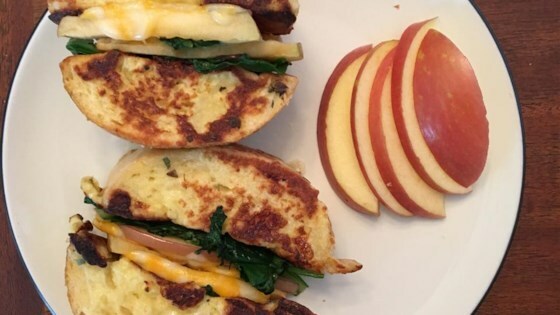 Layer spinach on top of 2 slices of French toast; top with apple slices and Cheddar cheese. Place a piece of French toast over Cheddar cheese layer creating a sandwich. Italian seasoning or any desired dried herb mix can be substituted for the herbes de Provence.